Mountain View, CA (Feb 13, 2019): With VR magician Jason McGuigan, discussed the use of immersive technologies for visiting inaccessible places, thought about parallels between space and ocean exploration, and shared the Hydrous’s VR film ‘Immerse’ with NASA staff as part of an Early Career Network seminar series. Novato, CA (Feb 9, 2019): Participated in a special workshop at XR Marin on how educators can use virtual reality. Attended by teachers, administrators, counselors, students, parents, curriculum developers, and VR content developers. 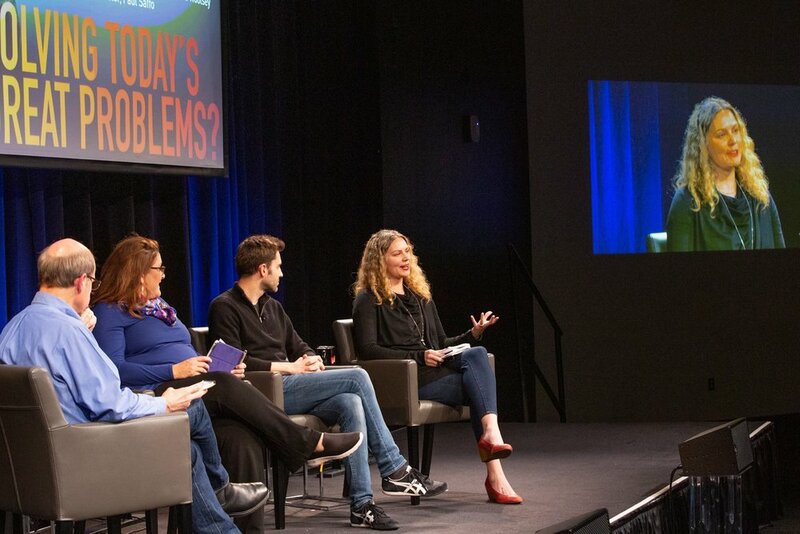 Mountain View, CA (December 12, 2018): Had the great honor of serving on a panel (Topic: Solving Today’s Greatest Problems) at the Computer History Museum to celebrate the 50th anniversary of Doug Engelbart’s “Mother of All Demos.” Discussed the role of technology for mobilizing positive change in the world, in the context of Engelbart’s vision and contributions. Watch HERE or HERE. San Jose, CA (November 10, 2018): I had the honor of speaking on a panel with other National Geographic Explorers at the Youth Climate Action Summit, held at the Tech Museum of Innovation. It was a great day; over 600 high school students participated in discussion and activities surrounding the global challenge of climate change. Learn more HERE. Plus, with the help of Viveport and Horizon Productions, I got to share the Hydrous’s in-progress VR film IMMERSE. San Francisco, CA (October 2018): Led a VR workshop for 40+ high school girls through a partnership with IGNITE (Inspiring Girls Now In Technology Evolution). IGNITE was founded in 1999 to help girls from disadvantaged and low-income backgrounds spark interest in Science, Technology, Engineering, and Math (STEM) fields. Learn more HERE. October 2018: Streamed into classrooms across the U.S. & Canada to talk to students about marine biology and coral reefs. Learn more about Exploring by the Seat of Your Pants HERE. Bay Area (August 2018): “Marin County Biologist Develops 3-D VR Ocean Exploration Curriculum.” Watch here. Washington, D.C. (June 2018): As a new National Geographic Explorer, presented on the Hydrous's "Exploration in Progress," Ocean Education Kits for middle school classrooms that teach ocean science with technologies like photogrammetry and virtual reality. Santa Rosa, CA (March 2018): Visiting Scientist for the Science Speaker Series. 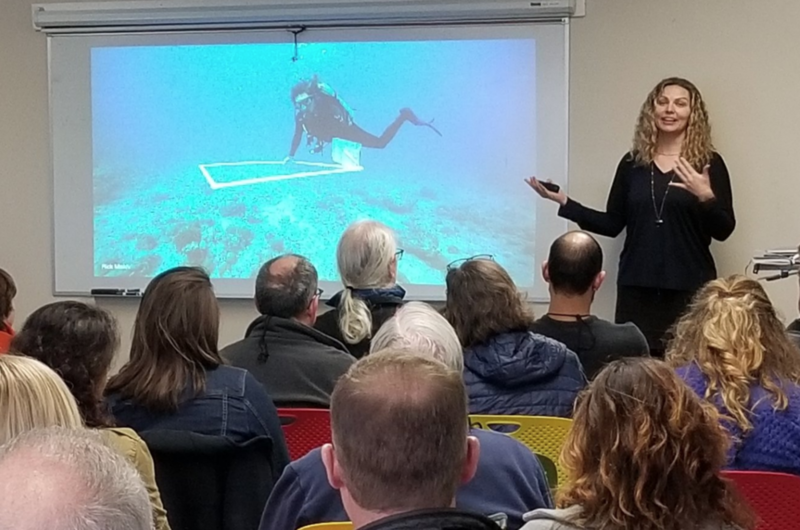 Told stories about my underwater adventures, shared imagery from beautiful ocean ecosystems like coral reefs, and talked about concepts like symbiosis and sustainability. Koror, Palau (February 2018): Led an inquiry-based activity to encourage scientific thinking and promote understanding for coral reefs. Students conducted experiments using 3D printed corals painted with thermo-chromic paint, that turned white in warm water, and experienced underwater 360º video. Stinson Beach, CA (February 2018): Presented to docents, discussed the role of new technologies such as virtual reality in connecting people to nature. Las Vegas, NV (November 2017). Presentation: “Digitizing Coral Reefs.” Watch here. Washington D.C. (October 2017). Smithsonian Digitization Fair, Keynote: “Digitizing Coral Reefs.” Watch here.